If you live in the U.S., this has been a long election season. Perhaps like me, you are stressed, worried, and want it to be over. Maybe you need a break–just three minutes of happy escape. Do I have the post for you! And if, perhaps, you teach art, I may have a project as well. Combining things in unexpected ways is a hallmark of creativity, one aspect of the SCAMPER process, and the basis of some models of creative thinking. In this delightful video, street art and nature combine to create images that range from powerful to whimsical and everything in between. Take a look. Really. Just stop for three minutes and enjoy. This makes me want to go outside with a camera, looking for inspiration. Perhaps your students will feel the same. 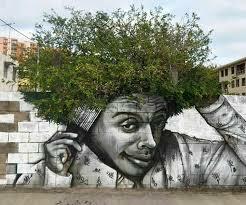 Some of you might live in areas where creating street art with your students is a possibility. If not, imagine taking photographs and combining them with drawings of what you’d love to add, if it were possible. If you try it, I’d love to see the results! « Hamilton, Schoolhouse Rock, What’s Next?